Five MPs have earned more than £200,000 since last year’s general election from outside interests on top of their Westminster salaries, according to parliamentary disclosures. A further 14 have more than doubled their £66,000 MPs’ pay with remuneration for speeches, consultancy work or serving as company directors. Others boosted their finances by finding time for some of the legal, medical or other work they did before entering the House of Commons. One MP disclosed that he earned £800 for selling sheep, while another receives thousands of pounds for advising a caravan club. 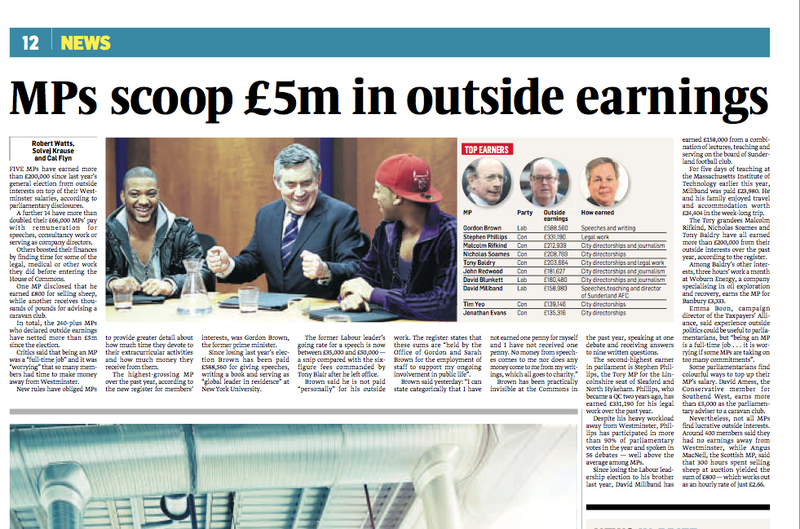 In total, the 240-plus MPs who declared outside earnings have netted more than £5m since the election. Critics said that being an MP was a “full-time job” and it was “worrying” that so many members had time to make money away from Westminster. New rules have obliged MPs to provide greater detail about how much time they devote to their extracurricular activities and how much money they receive from them. The highest-grossing MP over the past year, according to the new register for members’ interests, was Gordon Brown, the former prime minister. Since losing last year’s election Brown has been paid £588,560 for giving speeches, writing a book and serving as “global leader in residence” at New York University. The former Labour leader’s going rate for a speech is now between £35,000 and £50,000 — a snip compared with the six-figure fees commanded by Tony Blair after he left office. Brown said he is not paid “personally” for his outside work. The register states that these sums are “held by the Office of Gordon and Sarah Brown for the employment of staff to support my ongoing involvement in public life”. Brown has been practically invisible at the Commons in the past year, speaking at one debate and receiving answers to nine written questions. The second-highest earner in parliament is Stephen Phillips, the Tory MP for the Lincolnshire seat of Sleaford and North Hykeham. Phillips, who became a QC two years ago, has earned £331,190 for his legal work over the past year. Despite his heavy workload away from Westminster, Phillips has participated in more than 90% of parliamentary votes in the year and spoken in 56 debates — well above the average among MPs. Since losing the Labour leadership election to his brother last year, David Miliband has earned £158,000 from a combination of lectures, teaching and serving on the board of Sunderland football club. For five days of teaching at the Massachusetts Institute of Technology earlier this year, Miliband was paid £23,980. He and his family enjoyed travel and accommodation worth £24,404 in the week-long trip. The Tory grandees Malcolm Rifkind, Nicholas Soames and Tony Baldry have all earned more than £200,000 from their outside interests over the past year, according to the register. Among Baldry’s other interests, three hours’ work a month at Woburn Energy, a company specialising in oil exploration and recovery, earns the MP for Banbury £3,333. Emma Boon, campaign director of the Taxpayers’ Alliance, said experience outside politics could be useful to parliamentarians, but “being an MP is a full-time job … it is worrying if some MPs are taking on too many commitments”. Some parliamentarians find colourful ways to top up their MP’s salary. David Amess, the Conservative member for Southend West, earns more than £5,000 as the parliamentary adviser to a caravan club. Nevertheless, not all MPs find lucrative outside interests. Around 400 members said they had no earnings away from Westminster, while Angus MacNeil, the Scottish MP, said that 300 hours spent selling sheep at auction yielded the sum of £800 — which works out as an hourly rate of just £2.66.